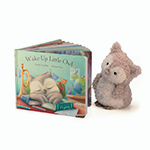 'Wake Up Little Owl' book along with Little Owl plushie is a fantastic set to give as a gift to any infant, child or anyone young at heart. "Little Owl!" the teacher calls. "It's not time to sleep at all." Follow mixed-up Little Owl as she drifts off in class at Night School. It might sound funny, but Wake Up Little Owl is the perfect story for bedtime! This bonny board book is adorably drawn, and sure to soothe little chicks to sleep. Included in this set is Little Owl plushie. A scruffly bundle, she's only a chick, but she's keen to learn when she goes to night school! Play with her soft suedey feet and beak before cuddling up to her tumbly tummy. Little Owl is just so fluffy, she flaps around like a cuddly cloud!